A former Special Constable in Ealing, now training to become a Police Officer, has been recognised for his achievements. Ravi Canhye was a Volunteer Police Officer (Special Constable) from April 2006 until June 2009, when he resigned to join the force full time. He worked at Ealing and West London Mental Health Trust as a mental health carer in his full time job, and dedicated his time as a Special Constable to creating a strong partnership between the local policing team and the NHS. 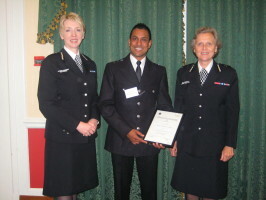 On Wednesday 17th June 2009, the National Policing Improvement Agency (NPIA) recognised Ravi’s excellent and innovative work as a Hospital Watch Special Constable and awarded him the National Employer Support Award. The judging panel were impressed with the initiative Ravi had shown in taking his experience from his day job as a mental health carer and applying it to pioneer the Hospital Watch Scheme in the Metropolitan Police Service. Ravi ensured that local police were correctly identifying Mental Health issues and he helped build an effective partnership between the hospital and their local safer neighbourhood team. He has since encouraged other staff from the Mental Health Trust and Ealing Hospital to apply to become Special Constables. Ravi is currently in training to be a full time Officer at Hendon and has been offered his first choice of borough – Ealing.